These curtains are great! 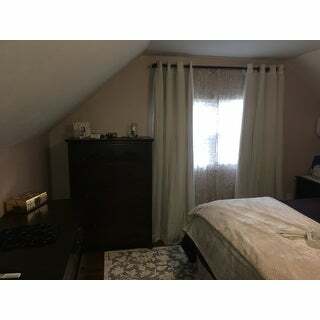 I wanted curtains that would block light but also look airy and beautiful at the same time. These fit the bill! The material is thick and soft to the touch, and has held up great over the last year. I'll be buying more when I move! Display this four-piece tulle lace blackout curtain set in your living room to instantly elevate your aesthetic to new heights of romanticism. Display the tulle lace on its own for a delicate look, or pair the tulle with the included blackout curtains for added privacy and style. The light, lovely tulle offsets the blackout panels wonderfully, lending texture and dimension to a space while blocking out sunlight and reducing noise. Let me just say that I ordered 4 different colors and styles of curtains before finding these. I ordered the Dove color and it blends perfectly with my gray walls. The off-white sheer tulle is perfect offset and adds a slight shimmer and elegance to my bedroom. The blackout curtains actually are blackout, I am a nurse and occasionally work third shift....so these are perfect. I love love love them! Absolutely LOVE these curtains! The blackout function truly does it's job! We hung these as close to our ceiling as we could, and only a strip of light peeks through on the sides. 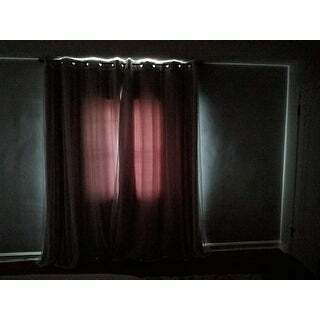 Our bedroom gets a lot of sun in the morning, but with these curtains, it's so easy to sleep in late on the weekends! Our walls are a very soft gray and I was a bit concerned about them matching, but the sheer white panel (separate/optional) on these curtains softens the gray panel beneath them and they blend well with our wall color (Lowes 4008-1A Bay Waves). The sheer overlay creates a soft cozy atmosphere, rather than just a modern straight gray panel. I am thrilled with this purchase! We hung Overstock "Top-down/ Bottom-up White Cellular Shade" over the windows for privacy when the curtains are open, while still allowing the soft sunlight through. Our ceiling light and rug are also from Overstock - "Silver Orchid Taylor Iron Shade Crystal Flush Mount Chandelier" and "Palm Canyon Yorba Moroccan Trellis White and Grey Shag Rug (8' x 10')"
I love these curtains. I wasn't sure what to expect but thanks to the good reviews I took a chance on them. They complete my room in a beautiful way. The sheer layer adds a soft look to the curtains that I think makes the look. 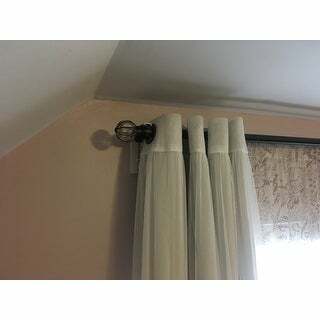 The price of the curtains was excellent and that is one of the reasons I love them so much. My second choice was almost double in cost. My husband loves the blackout feature as they do block out the light better than I expected. I love, love, love these! So unique. I love that they blackout the light and have the tulle. We have them in our master bedroom and I will be getting some for my girls' rooms. The dark grey matched the picture, and what's great is even if the color didn't match exactly, you would t. E able to tell with the tulle over it. They are skittle spendy(compaired to Honegoods where I usually purchase curtains) but they are very different and something you can't find everywhere. I'm in love. Option: Dove, 84" | Dove, 96"
I ordered these originally in the 96 inch length and had to return because they were 98 inches and too long. Reordered the 84 in which I received the day after I placed the order which was great. Now the disappointing thing is that the hemlines are not even and since they hang above the floor line it is very noticeable. I did not care for the sheer over the the blackout drape so I have it hung in the center which allows light during the day and they are thin enough that you can still get the benefit of the blackout at night. I did not return these even though I am not thrilled with the attention to detail on the hemlines. I purchased the gray which is darker than one might think 'dove' is but it works for my room. 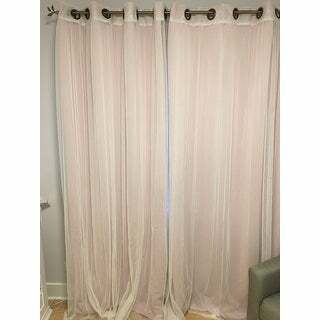 Putting the sheer over the curtain like shown in the pictures lightens the color a lot. I was hoping for more but I am satisfied for the price. 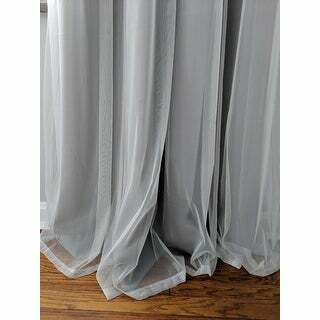 The grey curtains are definitely blackout, however the look of this curtain is not as pretty or dainty as it looks in the picture. Definitely not worth the price and it doesn't look expensive. The tulle lace is snow white, so if you are looking for ivory this is definitely not the right choice. Omg I am truly in love with these curtains. 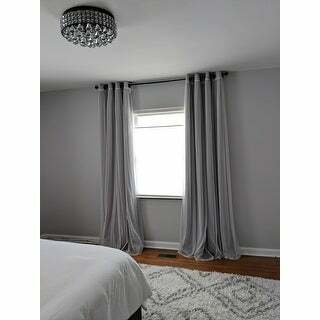 I ordered the 96 inch curtains in the color Dove (grey) and they are absolutely beautiful. Really elegant and stylish. These curtains were such a great price & completed our bedroom. After a year of owning our home we finally bought these curtains and they're romantic, soft and are very darkening - even the hubby enjoys how cozy they made the room feel! I was in the market for blackout curtains and was going to settle for a basic solid set (no frills). But then, I stumbled upon these. LOVE them. The tulle adds a sense of elegance that elevates the room. Highly recommend! I have hung blackout curtains before and been disappointed with the flat effect: the tulle overlay here makes all the difference. The biscuit color is gorgeous, a true neutral that pairs perfectly with my light gray walls (Benjamin Moore balboa mist). These curtains look expensive and they're gorgeous. Love them! Beautiful, great quality for the price........ No complaints!!! 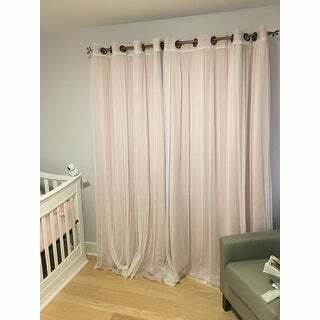 I bought these curtains for the nursery and while they are very cute they are a soft purple and definitely not pink. I am keeping them as I will add some purple colors but if I had known they were purple before hand I wouldn't have bought them. 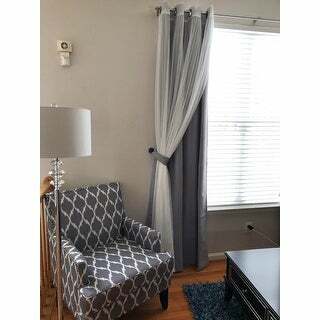 Option: Biscuit, 96" | Dove, 96"
These curtains are a nice gray and have a good weight to them. The sheer curtains are seperate and not attached with the other layer. Can't wait to hang them. Wow these were expensive but worth the $$! They are beautiful. Highly recommended. 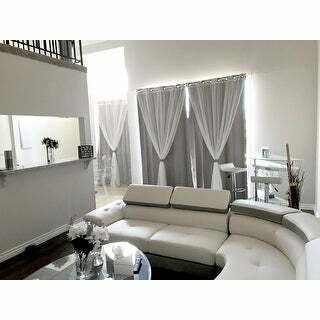 It is 4 piece package with 2 blackout curtains and 2 sheer curtains! Colour is just as advertised for the dove grey. 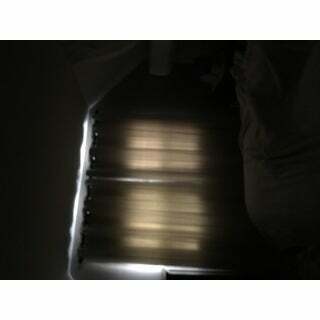 These curtains do provide a proper blackout but aren’t extremely heavy like some blackouts. Overall we’re very happy with them. These are not blackout curtains. You can still see the light of the windows coming through. Just Beautiful. 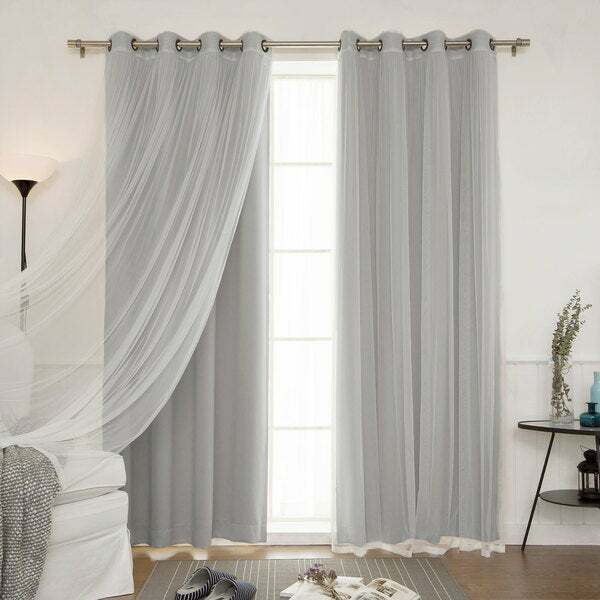 The shear curtains complement the gray curtains beautifully. Would recommend the purchase. I love them. I love these curtains! They are perfect in my little girls room. It's not complete blackout, but it is definitely close. The room is plenty dark enough for my girls to nap in. Option: Biscuit, 63" | Biscuit, 84"
Beautiful! Great quality. Would purchase again. not a fan. Not at all what I was expecting. I thought they looked cheap and like the overlay didn't really belong with the heavy underpanels. sadly, I sent them back. I’m so happy with this purchase. We Got a pink one for our baby daughter nursery... still a lot to be done in there that’s why I can’t post pictures yet. But it is just beautiful. Definitely worth the money. "How do you use the tie backs?" The second image shows some varieties for the tiebacks. "Would 3 be ok on a large window since there is not another option!" Each panel is 52 inches wide, so 1 set of total width would be 104 inches wide. We’re sorry that we can’t give you a certain answer since we don't know how wide your window is, but if the width of your window ranges from 208 inches to 312 inches, then 3 sets would be perfect. "Is there a way I can order just the sheer tulle curtains and not the blackout curtains?" "Can the biscuit color be customized to 108" length?" I really don't know why Overstock would be sending me an email with a question like this. Very annoying. This seems like a question for the manufacturer. "Is it available for longer size? 144 inch length?" "Do you have the option of using the sheer under instead of top ?" Yes. You do have that option and that’s actually what I did. I enjoy having them like that because I can pull back the top and the sheer allows in just the perfect amount of light with some privacy. "When will you have light pink 84 in stock"